In our monastic community of Mount Angel, we are blessed with so many friends and benefactors. 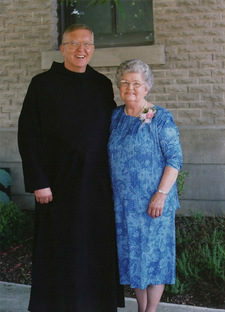 Through their constant spiritual and financial support, we are able to live as we do, stopping to pray in the Abbey church five times a day, taking time to welcome and visit all who come to enjoy the peace of our hilltop home, and devoting ourselves to preparing the next generation of priests at Mount Angel Seminary. Twice a year we publish a simple newsletter, Legacy,in which we remember those who have left (or plan to leave) a legacy gift to the Abbey and Seminary. In the fall newsletter, we highlight two of these people—one is still quite active and doing wonderful work with the elderly. The other was the mother of one of our monks, Fr. William Hammelman. We invite you to read their stories, and offer with us a prayer of gratitude for all who have helped us along the way.